LegalZoom is a jack-of-all-trades for online DIY legal work. From incorporations and trademarks to divorce, LegalZoom has the forms for you. You might think this would mean LegalZoom would suffer the fate of all generalists–not being good at any one thing in particular. LegalZoom’s LLC formation is reasonably priced and includes good features without weighing you down with too many options that you don’t need. Overall: An excellent alternative to the Company Corporation and Bizfilings. Figuring out how to order is pretty simple just visit Legalzoom’s business formation page . Like many online incorporators, LegalZoom has several packages that you can choose from. The least expensive package, called the Economy package is $149 + state fees. This package includes the minimum of what you need to form your LLC, except for obtaining your EIN. All of LegalZoom’s packages include a “customized” Operating Agreement. This is both helpful and potentially dangerous. First, if you plan on having any sort of complicated tax arrangement with your LLC, then you’re going to want to hire a lawyer to prepare your Operating Agreement. While forming an LLC — meaning filing Articles of Organization — is basically a ministerial/administrative task, an Operating Agreement is a true legal document. There are a million ways to do things right or wrong when preparing an Operating Agreement. If you’re starting a company from scratch and are using your LLC as a pass-through entity, you can stick with the standard Operating Agreement terms that are implied by state law. These concerns are not a reason NOT to use LegalZoom–you can simply choose not to use the Operating Agreements that they send you. In my experience, opening a bank account doesn’t require you to show the bank a copy of your LLC’s resolutions authorizing the use of a bank account. They’ll want to see the Certificate of Formation from your state to prove that the entity exists. Like other incorporators, for an extra $100+ they will draw up and file your EIN (Employer Identification Number) for you. However, you can file the EIN yourself here. I used LegalZoom last year to form an LLC in Illinois, and the process went fine. Unless you really need to save the $149 by preparing your Articles of Organization yourself, then LegalZoom is an excellent choice. When you’re actually ready to order, you simply select your State and whether you want regular or Expedited service. In this case, I chose an LLC in Illinois. One aspect I like about LegalZoom’s order page is that they break out the state filing fees from their charges–$500 in state fees (Illinois, in this example) and $149 for an Economy limited liability formation. This isn’t a deal breaker for me, but it’s yet another password and username combination I have to remember. If you use LegalZoom’s registered agent service, it is an additional cost. If you’re forming your LLC in a state other than where you live, then you definitely need registered agent service. Even if you are forming your LLC in your home state, using a registered agent can increase your privacy. Because the registered agent address of every LLC is part of the public record, you might want to keep your home address private, and paying $149/yr for registered agent service would be worth it. 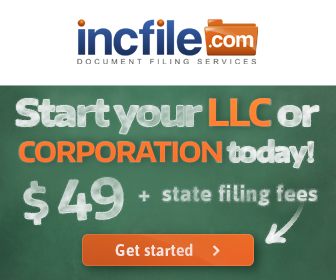 While LegalZoom has a well-known service, IncFile does the same thing and forms your business LLC for only $49 plus state fees, which is a $100 savings. The registered agent is free for the first six months too. Compare the two to see which works best for you.